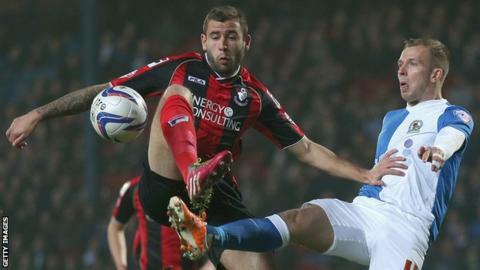 Jordan Bowery's injury-time header salvaged a point for Rotherham in a battle of two out-of-form sides at Bournemouth. The visitors' substitute headed in Paul Taylor's corner to deny the hosts in a match they dominated. Bournemouth's Callum Wilson hit the post with only Rotherham goalkeeper Adam Collin to beat before Steve Cook headed the Cherries into the lead. But Bowery nodded home Taylor's set-piece three minutes into stoppage time. The South Yorkshire side, who before the game were the lowest scorers in the Championship, included a new strike partnership consisting of deadline day additions Jonson Clarke-Harris, a club-record buy from Oldham, and Luciano Becchio, who joined from Leeds. Clarke-Harris was denied by Bournemouth keeper Lee Camp when clean through but it was a rare chance in a first half of few chances. After the break, Cherries' Yann Kermorgant hooked a Marc Pugh cross over before fellow striker Wilson trod on the ball from six yards out with the goal gaping. Millers' manager Steve Evans took off Clarke-Harris and Becchio in the second half but it initially failed to have the desired effect when Matt Ritchie picked out defender Cook at the back post with a delicate cross. Cook, who had remained forward after a corner, duly nodded Bournemouth ahead. With time ticking Alex Revell, Becchio's replacement, failed to connect with a low delivery from Matt Derbyshire on the right. Rotherham continued to push forward searching for a leveller which arrived when Bowery struck - before running into the outstretched arms of a delighted Evans. The result leaves the Cherries 13th and the Millers 18th. "It is a tough one to take for us because when you work so hard for your goal like we did and there are seconds left to go, you expect to win. "Today, it was a tight game and we know how Rotherham play but for 89 minutes we answered all those questions. But we switched off, we conceded and it is something we have to work on. I am disappointed with the first-half performance. "The onus was on us as the home team to take the game to Rotherham." "When we were coming down on the coach yesterday, Luciano Becchio was going to be on the bench, but then I thought again because he has needed game time. "I brought Bowery and Alex Revell on and we were definitely a better side after that. "I was going to bring Jordan on after 60 minutes and I am so pleased that he has got a goal. You could see what it meant to the young man. He tries incredibly hard. "You saw his reaction, the way he ran over to the bench to celebrate but it is typical of the spirit of the camp and among the squad we have got." Match ends, Bournemouth 1, Rotherham United 1. Second Half ends, Bournemouth 1, Rotherham United 1. Attempt blocked. Ryan Fraser (Bournemouth) left footed shot from outside the box is blocked. Assisted by Eunan O'Kane. Attempt saved. Andrew Surman (Bournemouth) left footed shot from outside the box is saved in the centre of the goal. Assisted by Brett Pitman. Goal! Bournemouth 1, Rotherham United 1. Jordan Bowery (Rotherham United) header from very close range to the centre of the goal. Assisted by Paul Taylor with a cross following a corner. Corner, Rotherham United. Conceded by Lee Camp. Substitution, Bournemouth. Andrew Surman replaces Matt Ritchie. Richard Smallwood (Rotherham United) is shown the yellow card for a bad foul. Paul Taylor (Rotherham United) wins a free kick on the left wing. Ryan Fraser (Bournemouth) is shown the yellow card. Ryan Fraser (Bournemouth) has gone down, but that's a dive. Substitution, Bournemouth. Ryan Fraser replaces Marc Pugh. Attempt missed. Kári Arnason (Rotherham United) right footed shot from outside the box is high and wide to the right. Attempt blocked. Frazer Richardson (Rotherham United) right footed shot from outside the box is blocked. Assisted by Richard Smallwood. Attempt blocked. Brett Pitman (Bournemouth) right footed shot from the centre of the box is blocked. Assisted by Simon Francis with a cross. Joe Skarz (Rotherham United) wins a free kick in the defensive half. Attempt blocked. Matt Ritchie (Bournemouth) left footed shot from the right side of the box is blocked. Assisted by Eunan O'Kane. Offside, Rotherham United. Paul Taylor tries a through ball, but Matt Derbyshire is caught offside. Substitution, Bournemouth. Brett Pitman replaces Yann Kermorgant. Delay in match Yann Kermorgant (Bournemouth) because of an injury. Substitution, Rotherham United. Matt Derbyshire replaces Ben Pringle because of an injury. Attempt saved. Matt Ritchie (Bournemouth) left footed shot from outside the box is saved in the bottom right corner. Assisted by Simon Francis with a headed pass. Joe Skarz (Rotherham United) is shown the yellow card for a bad foul. Matt Ritchie (Bournemouth) wins a free kick in the defensive half. Attempt blocked. Eunan O'Kane (Bournemouth) right footed shot from outside the box is blocked. Goal! Bournemouth 1, Rotherham United 0. Steve Cook (Bournemouth) header from the centre of the box to the bottom left corner. Assisted by Matt Ritchie with a cross following a set piece situation.